Tyson Foods is recalling approximately 69,093 pounds of frozen, ready-to-eat chicken strip products that may be contaminated with extraneous materials, specifically pieces of metal, according to the U.S. Department of Agriculture’s Food Safety and Inspection Service. ● 25-oz. 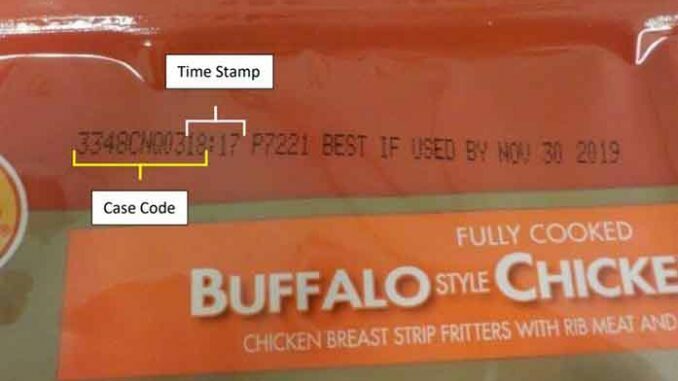 plastic bag packages of frozen “Tyson FULLY COOKED BUFFALO STYLE CHICKEN STRIPS CHICKEN BREAST STRIP FRITTERS WITH RIB MEAT AND BUFFALO STYLE SAUCE” with “BEST IF USED BY NOV 30 2019,” case codes 3348CNQ0317 and 3348CNQ0318, and individual bag time stamps from 17:00 through 18:59 hours (inclusive). ● 25-oz. plastic bag packages of frozen “Tyson FULLY COOKED CRISPY CHICKEN STRIPS CHICKEN BREAST STRIP FRITTERS WITH RIB MEAT” with “BEST IF USED BY NOV 30 2019,” case codes 3348CNQ0419, 3348CNQ0420, 3348CNQ0421, and 3348CNQ0422, and individual bag time stamps from 19:00 through 22:59 hours (inclusive). ● 20-lb. cases of frozen “SPARE TIME FULLY COOKED, BUFFALO STYLE CHICKEN STRIPS CHICKEN BREAST STRIP FRITTERS WITH RIB MEAT AND BUFFALO STYLE SAUCE” with “BEST IF USED BY NOV 30 2019,” and case code 3348CNQ03.